The day after the Black Belt Grading, a Kobudo class was held at Annangrove Dojo on December 4th. Practising Chibana no Sai with a smile. Shihan Rick Cunningham supervised the class. 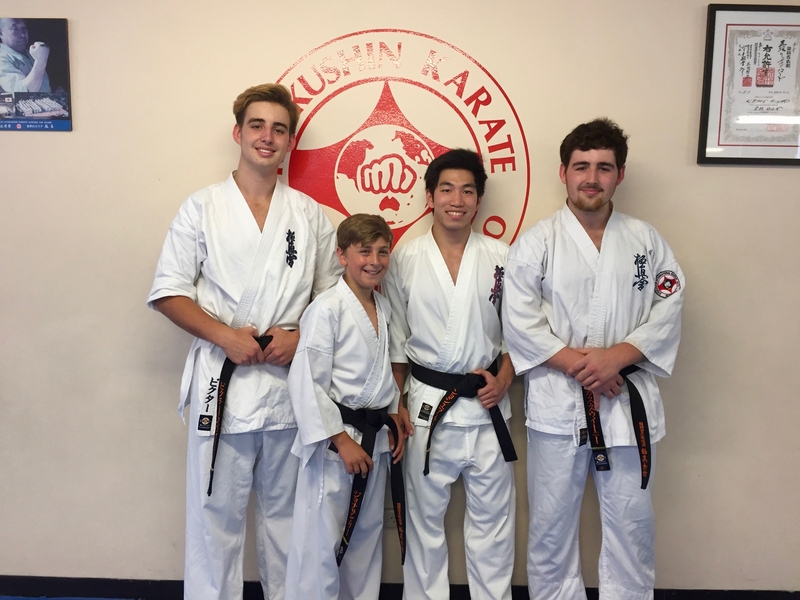 Sensei Paul Finnerty took weapons beginner Mick Calnan through the basics of the Bo, while Sempai Alex Lloyd took the seniors and Wesley Snider through all the Bo katas as well as the Sai. Sensei Mark McFadden, Sensei Jon Ellis and Sempai Patricia Tan enjoyed the practice for the upcoming 2017 Japan trip. Sensei Paul teaching Mick the Bo. Sempai Alex checks Sempai Trish’s technique. Shihan Rick was very impressed with the standard displayed by Sempai Trish and Wes, and surprised them with a Kobudo grading. Sempai Trish was graded to 2nd Kyu and Wes to 4th Kyu in Kobudo. Congratulations to both, especially the day after participating in a senior grading! 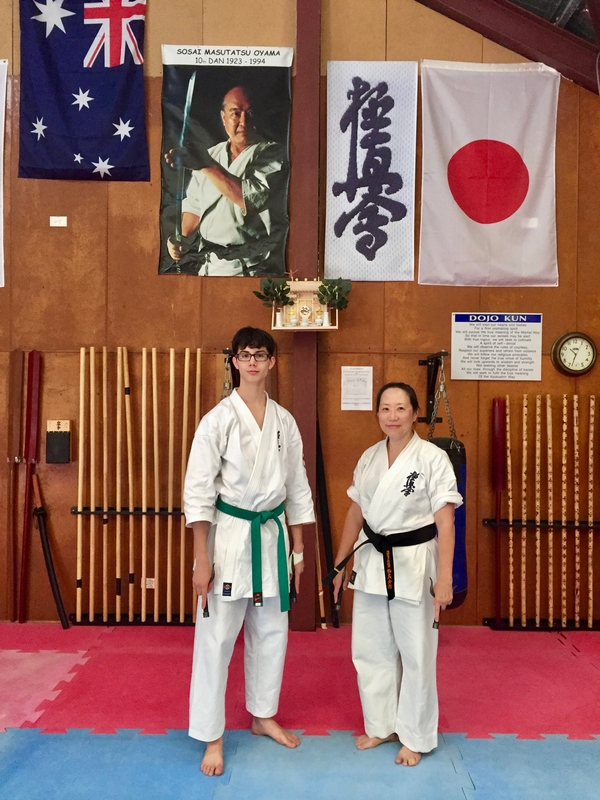 Wes and Sempai Trish after their Kobudo grading, 5 December 2016. At the Monday night general class at Turramurra Dojo, on December 5th, KIMAA’s bruised but proud local Shodans attended training. Shihan Howard Lipman was pleased to see the students in such good spirits. They were given a good stretch and work out, from fitness to fight training to bunkai, by Sensei Ben Ng, Sensei Don Cheong and Sempai Alex Lloyd. Sempai Victor Sweeney, Sempai Joshua Darley, Sempai Jonathan Lee and Sempai Angus Sweeney, 5 December 2016. 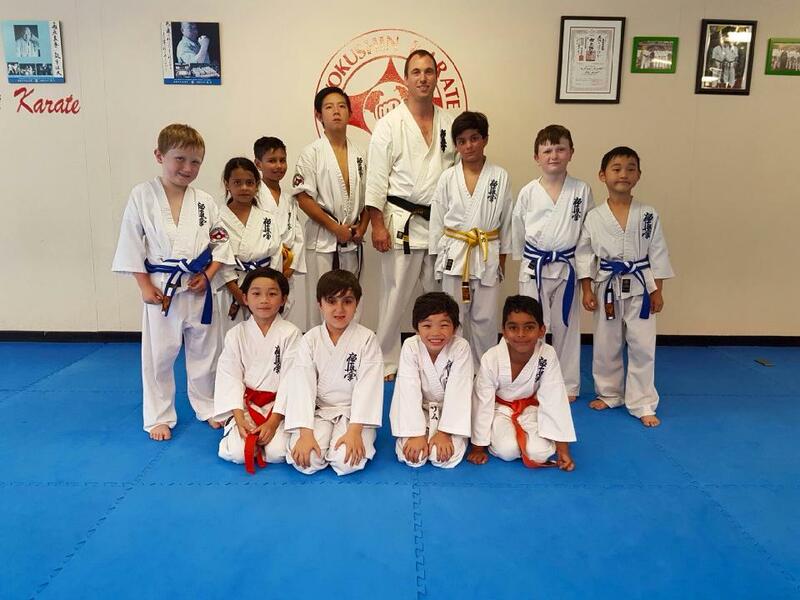 On Wednesday December 7th, a Kyokushin Karate grading was held for the Turramurra Dojo kids class. Sensei James Sidwell took the grading and assessed the students. He was very happy with everyone’s efforts. Well done to all. A few students who missed this grading were graded by Shihan Howard Lipman on Monday December 12th, with Sempai Josh Darley assisting. Sensei James Sidwell with the participants of the Kids Karate Grading, 7 December 2016.